Another major economic organisation has warned about how Britain leaving the European Union — Brexit — could severely damage the German economy. According to new analysis from the highly respected Ifo Institute for Economic Research, a German research house, the “biggest risk” facing the German economy right now is Brexit, and Germany has an “awful lot to lose” in the event that Britain does exit the EU. The Ifo Institute also argues that in the long-term as much as 3% could be shaved off the country’s growth thanks to Brexit. Ifo’s analysis of what will happen to Germany following Brexit focuses on the trade impacts of the UK exiting the Single Market. It argues that international trade will be more expensive and more difficult for Britain to undertake, profoundly affecting the German economy. Britain is Germany’s third largest trading partner, and as a result the trade impacts on Germany are likely to be strongly felt, especially in export-oriented industries like the automotive, chemical and pharmaceutical industries as well as mechanical engineering. Overall, Germany exported goods and services worth about €120 billion (£95 billion, $134 billion) to the UK, or about 8% of all German exports. The warning from the Ifo is the second report in two days which list the potential risks to Europe’s biggest economy caused by Brexit. 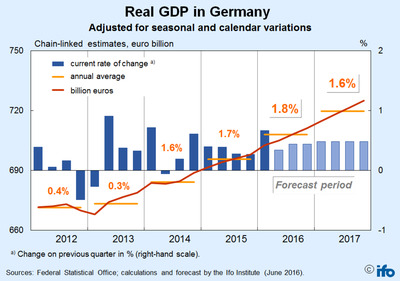 Yesterday, an analysis by the German Institute for Economic Research, a separate organisation, reported that Brexit would have a materially negative effect on the biggest economy in Europe and reduce German GDP growth by as much as half a percentage point in 2017, with GDP growth losing one-tenth of a percentage point this year as a result of the vote. Britain will decide on whether to leave the European Union on June 23, with polls currently showing that the Leave campaign has built a substantial lead ahead of the vote. 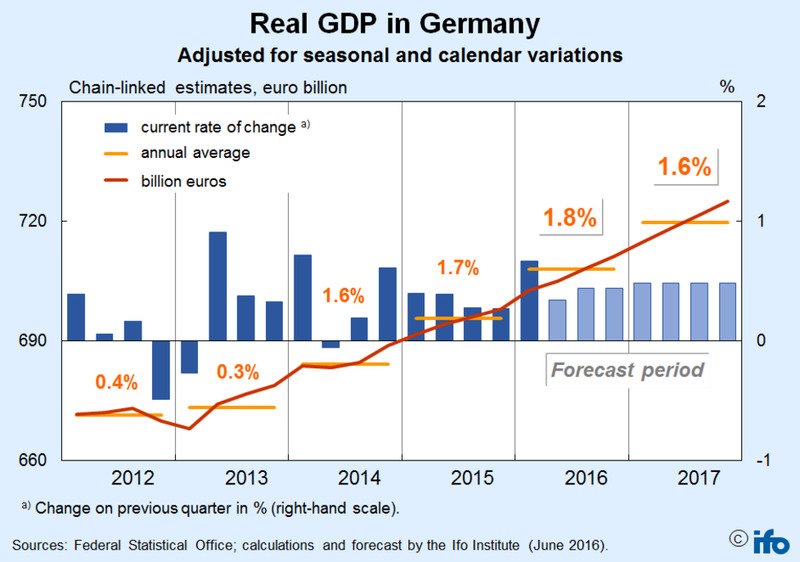 Elsewhere in the Ifo’s latest research, it raised its forecasts for German growth in 2016 from 1.6% to 1.8%, citing low energy costs, low interest rates, and good domestic demand as reasons for the upgrade. “The first quarter went better than expected. The moderate upswing sustained since 2014 is going into its second half. It may even run into extra time,” said Timo Wollmershäuser, a senior Ifo employee.